For the last several years, lateral hiring in New York has plateaued. While other markets rose and fell, hiring by major firms in New York barely fluctuated. In 2017, 155 major firms hired 1269 experienced associates, after hiring 1249 associates in 2016 and 1237 associates in 2015. Whether New York maintains the same hiring pace as past years mostly has to do with the global economy and structural shifts in legal practice, but so far our lateral data shows no signs of a stagnating market, either in hiring (firms recorded 173 hires in January and February, on pace with previous years) or in the number of jobs on the market. 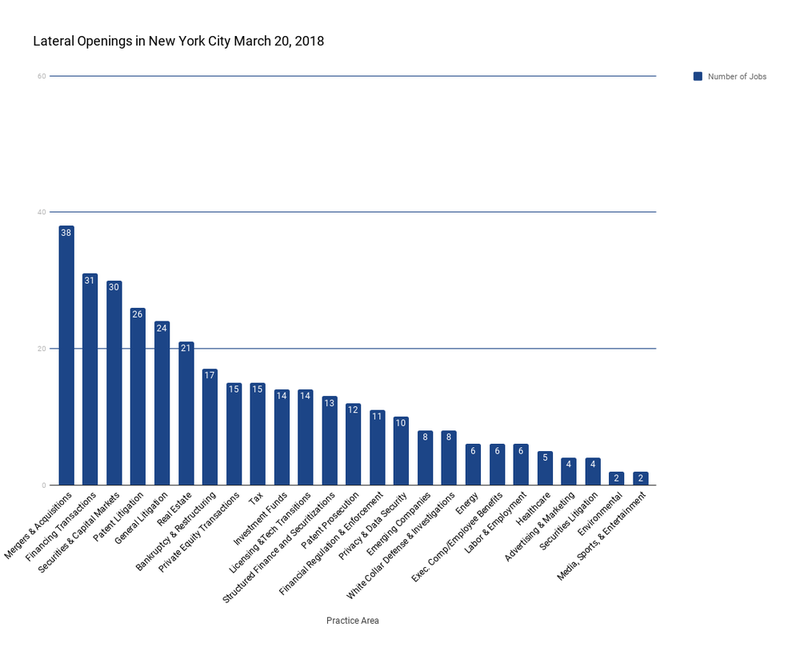 Right now there are 241 open lateral jobs in New York City. 150 of them were listed between January 1st and March 20th, more than during the same period last year, when firms listed only 105 new jobs. That’s a meaningful increase in market activity, but we are cautious about declaring it a trend yet. New York firms hire associates who have a little experience or a lot of experience, but few who are in between. That is not by choice. The wisdom passed down by headhunters is that the best time to lateral is as a mid-level with three to six years of experience under your belt. But that is not when most New York associates choose to lateral, and it is not the type of candidate who firms usually hire. The blue line shows the number of lateral openings in New York since 2015 seeking associates with 0 to 2 years of experience, 2 to 4 years of experience, 4 to 6 years of experience, and/or more than 6 years of experience. The red line shows the actual number of associates that firms hired at those levels. You’ll notice wide gaps between openings and hires, especially for late midlevels. While firms advertise a need for midlevel and late-midlevel associates most often, they hire early-midlevel and even junior associates far more often. Firms also rarely advertise jobs for senior level associates, but hire them in significant numbers. A couple of things are going on. Despite firms expressing interest in more seasoned midlevel associates, these associates are hard to find. At that late-midlevel stage, an associate's options to go in-house have increased and many associates are making a run at partner. So firms end up taking the best candidates available and hiring more junior lawyers than they originally anticipated. The other thing that is going on is that firms are not advertising jobs for senior associates, but are hiring them nonetheless, often quietly through recruiters. These senior associates have a good grasp of their likelihood of making partner by this stage in their careeers. If their chances are low, and they can find a firm with a gap in its senior ranks, lateralling becomes a good option. This dynamic in the NY lateral market can be a tremendous boon to junior lawyers looking to advance their careers. It’s common these days for an associate to gain just two or three years of experience at a top firm, then lateral to a firm with better partnership prospects as a more seasoned and mature lawyer, but still early enough to get on the path to partnership. Not all practices are equal for those looking to lateral in New York. There is way more demand for some associates than others. There are plenty of jobs in M&A, debt finance, securities, and patent litigation, as there have been for years. Those are not necessarily the practices where associates are in highest demand, however. The practice areas in highest demand are those where firms have the greatest need relative to the supply of associates. To roughly estimate that demand, we counted the number of 2nd to 5th year associates with experience in various practice areas and compared it to the number of current job openings. The graph below shows the number of associates per job opening. Associates trained in patent prosecution, advertising, financial regulation, privacy and environmental law, all with fewer than 10 associates per job opening, are in highest demand at the moment. Associates with white collar, general litigation, and securities litigation backgrounds, with 65 to 85 associates per job opening, are facing the stiffest competition—and have been for a while. Twelve firms accounted for 27% of hiring in New York last year, but there’s a vast long tail of firms to explore. Out of 1269 hires last year, the top 12 firms made 343 of them (27%) and Kirkland & Ellis made 74 hires alone (6%). Sometimes the best firms to join are the ones that are growing and hiring associates at the fastest pace. Other times, the right fit is a firm in the vast long tail of employers that make a handful of strategic hires a year. Before starting the lateral process, you’ll want to find a recruiter who has done plenty of research and can make sure you cover the whole market relevant to you. New York is unlike any other market in the country for a job search. Job searches in NY are quite unlike searches in other markets because the market is way bigger, with more moving parts. Candidates have more options and so do firms, which can sometimes turn the process into a slow game of musical chairs. Firms looking to maximize their outcomes will play the market, interview lots of candidates, and even leave stellar candidates in a holding pattern while they conduct their process. A great recruiter is able to manage this process and turn it to a candidate’s advantage (as well as the firm’s advantage, by helping them pull the trigger on you). Their job is to maintain parallel hiring processes at multiple firms in order get the candidate a succession of offers and maximize their leverage. It’s not always a straight line to get there, but every top candidate in New York needs a recruiter able to backchannel with firms and play the game effectively. The head of our New York practice, who helps candidates through this process, is a former Cravath lawyer who has placed 100+ attorneys in the last several years. You can reach out to Derek Mize by email (dmize@laterally.com). Or, you can sign up on Laterally to see what jobs are on market and we'll reach out to you.